How "free trade" is destroying Third World agriculture--and who's fighting back. 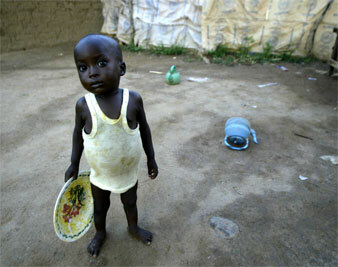 AP Images A child in Abuja, Nigeria, waits for food. The Mexican food crisis cannot be fully understood without taking into account the fact that in the years preceding the tortilla crisis, the homeland of corn had been converted to a corn-importing economy by “free market” policies promoted by the International Monetary Fund (IMF), the World Bank and Washington. The process began with the early 1980s debt crisis. One of the two largest developing-country debtors, Mexico was forced to beg for money from the Bank and IMF to service its debt to international commercial banks. The quid pro quo for a multibillion-dollar bailout was what a member of the World Bank executive board described as “unprecedented thoroughgoing interventionism” designed to eliminate high tariffs, state regulations and government support institutions, which neoliberal doctrine identified as barriers to economic efficiency. This blow to peasant agriculture was followed by an even larger one in 1994, when the North American Free Trade Agreement went into effect. Although NAFTA had a fifteen-year phaseout of tariff protection for agricultural products, including corn, highly subsidized US corn quickly flooded in, reducing prices by half and plunging the corn sector into chronic crisis. Largely as a result of this agreement, Mexico’s status as a net food importer has now been firmly established. It has become increasingly difficult for Mexican corn farmers to avoid the fate of many of their fellow corn cultivators and other smallholders in sectors such as rice, beef, poultry and pork, who have gone under because of the advantages conferred by NAFTA on subsidized US producers. According to a 2003 Carnegie Endowment report, imports of US agricultural products threw at least 1.3 million farmers out of work–many of whom have since found their way to the United States. The Philippines provides a grim example of how neoliberal economic restructuring transforms a country from a net food exporter to a net food importer. The Philippines is the world’s largest importer of rice. Manila’s desperate effort to secure supplies at any price has become front-page news, and pictures of soldiers providing security for rice distribution in poor communities have become emblematic of the global crisis. Paradoxically, the next few years under the new democratic dispensation saw the gutting of government investment capacity. As in Mexico the World Bank and IMF, working on behalf of international creditors, pressured the Corazon Aquino administration to make repayment of the $26 billion foreign debt a priority. Aquino acquiesced, though she was warned by the country’s top economists that the “search for a recovery program that is consistent with a debt repayment schedule determined by our creditors is a futile one.” Between 1986 and 1993 8 percent to 10 percent of GDP left the Philippines yearly in debt-service payments–roughly the same proportion as in Mexico. Interest payments as a percentage of expenditures rose from 7 percent in 1980 to 28 percent in 1994; capital expenditures plunged from 26 percent to 16 percent. In short, debt servicing became the national budgetary priority. Spending on agriculture fell by more than half. The World Bank and its local acolytes were not worried, however, since one purpose of the belt-tightening was to get the private sector to energize the countryside. But agricultural capacity quickly eroded. Irrigation stagnated, and by the end of the 1990s only 17 percent of the Philippines’ road network was paved, compared with 82 percent in Thailand and 75 percent in Malaysia. Crop yields were generally anemic, with the average rice yield way below those in China, Vietnam and Thailand, where governments actively promoted rural production. The post-Marcos agrarian reform program shriveled, deprived of funding for support services, which had been the key to successful reforms in Taiwan and South Korea. As in Mexico Filipino peasants were confronted with full-scale retreat of the state as provider of comprehensive support–a role they had come to depend on. And the cutback in agricultural programs was followed by trade liberalization, with the Philippines’ 1995 entry into the World Trade Organization having the same effect as Mexico’s joining NAFTA. WTO membership required the Philippines to eliminate quotas on all agricultural imports except rice and allow a certain amount of each commodity to enter at low tariff rates. While the country was allowed to maintain a quota on rice imports, it nevertheless had to admit the equivalent of 1 to 4 percent of domestic consumption over the next ten years. In fact, because of gravely weakened production resulting from lack of state support, the government imported much more than that to make up for shortfalls. The massive imports depressed the price of rice, discouraging farmers and keeping growth in production at a rate far below that of the country’s two top suppliers, Thailand and Vietnam. The consequences of the Philippines’ joining the WTO barreled through the rest of its agriculture like a super-typhoon. Swamped by cheap corn imports–much of it subsidized US grain–farmers reduced land devoted to corn from 3.1 million hectares in 1993 to 2.5 million in 2000. Massive importation of chicken parts nearly killed that industry, while surges in imports destabilized the poultry, hog and vegetable industries. During the 1994 campaign to ratify WTO membership, government economists, coached by their World Bank handlers, promised that losses in corn and other traditional crops would be more than compensated for by the new export industry of “high-value-added” crops like cut flowers, asparagus and broccoli. Little of this materialized. Nor did many of the 500,000 agricultural jobs that were supposed to be created yearly by the magic of the market; instead, agricultural employment dropped from 11.2 million in 1994 to 10.8 million in 2001. What Block did not say was that the lower cost of US products stemmed from subsidies, which became more massive with each passing year despite the fact that the WTO was supposed to phase them out. From $367 billion in 1995, the total amount of agricultural subsidies provided by developed-country governments rose to $388 billion in 2004. Since the late 1990s subsidies have accounted for 40 percent of the value of agricultural production in the European Union and 25 percent in the United States. De-peasantization is at an advanced state in Latin America and Asia. And if the World Bank has its way, Africa will travel in the same direction. As Bryceson and her colleagues correctly point out in a recent article, the World Development Report for 2008, which touches extensively on agriculture in Africa, is practically a blueprint for the transformation of the continent’s peasant-based agriculture into large-scale commercial farming. However, as in many other places today, the Bank’s wards are moving from sullen resentment to outright defiance. The support that African governments were allowed to muster was channeled by the World Bank toward export agriculture to generate foreign exchange, which states needed to service debt. But, as in Ethiopia during the 1980s famine, this led to the dedication of good land to export crops, with food crops forced into less suitable soil, thus exacerbating food insecurity. Moreover, the World Bank’s encouragement of several economies to focus on the same export crops often led to overproduction, triggering price collapses in international markets. For instance, the very success of Ghana’s expansion of cocoa production triggered a 48 percent drop in the international price between 1986 and 1989. In 2002-03 a collapse in coffee prices contributed to another food emergency in Ethiopia. As in Mexico and the Philippines, structural adjustment in Africa was not simply about underinvestment but state divestment. But there was one major difference. In Africa the World Bank and IMF micromanaged, making decisions on how fast subsidies should be phased out, how many civil servants had to be fired and even, as in the case of Malawi, how much of the country’s grain reserve should be sold and to whom. Malawi’s defiance of the World Bank would probably have been an act of heroic but futile resistance a decade ago. The environment is different today, since structural adjustment has been discredited throughout Africa. Even some donor governments and NGOs that used to subscribe to it have distanced themselves from the Bank. Perhaps the motivation is to prevent their influence in the continent from being further eroded by association with a failed approach and unpopular institutions when Chinese aid is emerging as an alternative to World Bank, IMF and Western government aid programs. It is not only defiance from governments like Malawi and dissent from their erstwhile allies that are undermining the IMF and the World Bank. Peasant organizations around the world have become increasingly militant in their resistance to the globalization of industrial agriculture. Indeed, it is because of pressure from farmers’ groups that the governments of the South have refused to grant wider access to their agricultural markets and demanded a massive slashing of US and EU agricultural subsidies, which brought the WTO’s Doha Round of negotiations to a standstill. Farmers’ groups have networked internationally; one of the most dynamic to emerge is Via Campesina (Peasant’s Path). Via not only seeks to get “WTO out of agriculture” and opposes the paradigm of a globalized capitalist industrial agriculture; it also proposes an alternative–food sovereignty. Food sovereignty means, first of all, the right of a country to determine its production and consumption of food and the exemption of agriculture from global trade regimes like that of the WTO. It also means consolidation of a smallholder-centered agriculture via protection of the domestic market from low-priced imports; remunerative prices for farmers and fisherfolk; abolition of all direct and indirect export subsidies; and the phasing out of domestic subsidies that promote unsustainable agriculture. Via’s platform also calls for an end to the Trade Related Intellectual Property Rights regime, or TRIPs, which allows corporations to patent plant seeds; opposes agro-technology based on genetic engineering; and demands land reform. In contrast to an integrated global monoculture, Via offers the vision of an international agricultural economy composed of diverse national agricultural economies trading with one another but focused primarily on domestic production. Once regarded as relics of the pre-industrial era, peasants are now leading the opposition to a capitalist industrial agriculture that would consign them to the dustbin of history. They have become what Karl Marx described as a politically conscious “class for itself,” contradicting his predictions about their demise. With the global food crisis, they are moving to center stage–and they have allies and supporters. For as peasants refuse to go gently into that good night and fight de-peasantization, developments in the twenty-first century are revealing the panacea of globalized capitalist industrial agriculture to be a nightmare. With environmental crises multiplying, the social dysfunctions of urban-industrial life piling up and industrialized agriculture creating greater food insecurity, the farmers’ movement increasingly has relevance not only to peasants but to everyone threatened by the catastrophic consequences of global capital’s vision for organizing production, community and life itself.